Bible Promises can be downloaded here, Bible Promises. It is less than 1 megabyte. Just open the zip file, place the Bible Promises executable anywhere and run it. 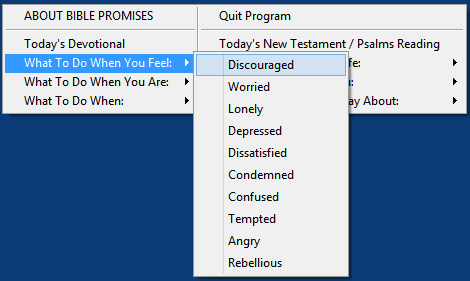 I was thinking lately how slack I’ve been at updating my Bible Study application. I just had no new ideas until recently. While browsing the web for lists of promises that God makes to His children in the Holy Bible, I ran across some PDF formatted booklets. 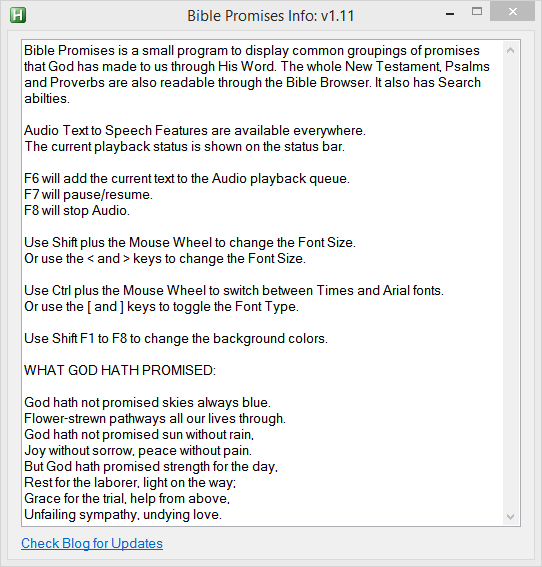 One of them on this page http://www.pathlights.com/Bible%20Promises/Bible-Promises.pdf was in a format I could quickly adapt to an application. This would be a “quickie” application for those who desire a very light Bible program. By creating a popup menu in the place of a Table of Contents, the program is very easy to navigate. The popup menu also is shown when you click the program’s icon in the task bar. You can click anywhere else to close it. Simply select a desired group of promises from the menu. For convenience for readers, you may change the font size from 8 to 24 point and change the font from Times to Arial. The background color is also changeable via Shift F1 to F8. Click About Bible Promises for information. This program starts with a centered popup menu which disappears when you select an item. When you close the item’s window, the menu is re-displayed. If you click away from the menu, it will disappear. In order to show it again, click on the program’s icon in the Task Bar at the right side. You can select Auto Start and the program will add a shortcut to your startup folder. 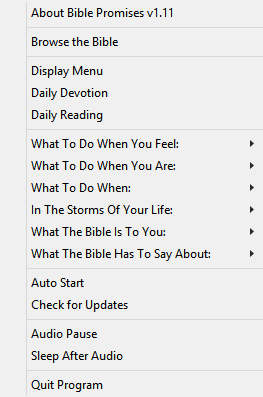 The program also has a Bible Browser option that is found in the tray menu and by clicking Today’s New Testament / Psalms readings. Choosing the browser displays this window. The text size and background color will match the other windows and the window is resizable. You may easily navigate the New Testament and Psalms/Proverbs and also do text searches. For example, searching on Jesus Christ displays the following. You may press F6 to have the program play Audio for you. I hope this is a worthy addition to the program. 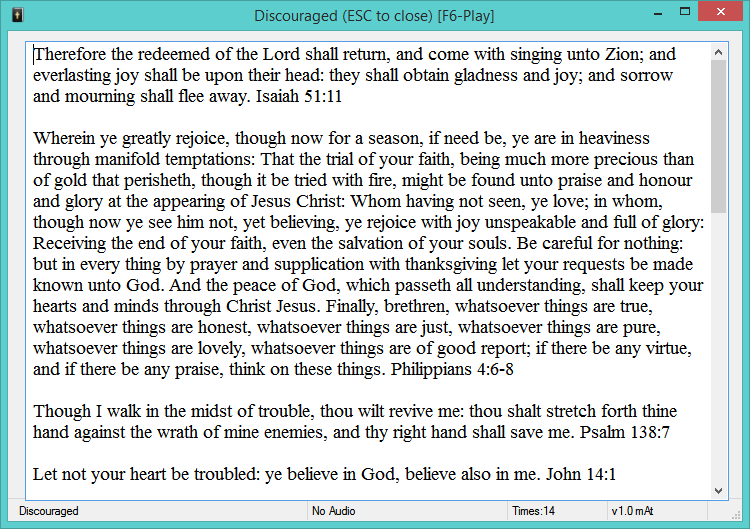 Version 1.11 – Bible Browser window can be resized now. Version 1.10 – Added keys to change Font Size and Type (<, >, [ and ]) for laptops without a Mouse. Version 1.09 – Bug fix, Bible Browser size settings now restored properly. Version 1.08 – Added Audio Pause option to the tray menu. 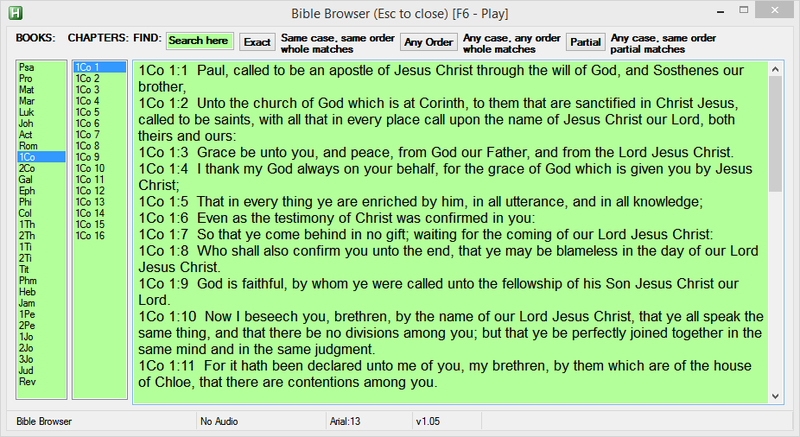 Version 1.07 – Bible Browser window is separately sizeable now. 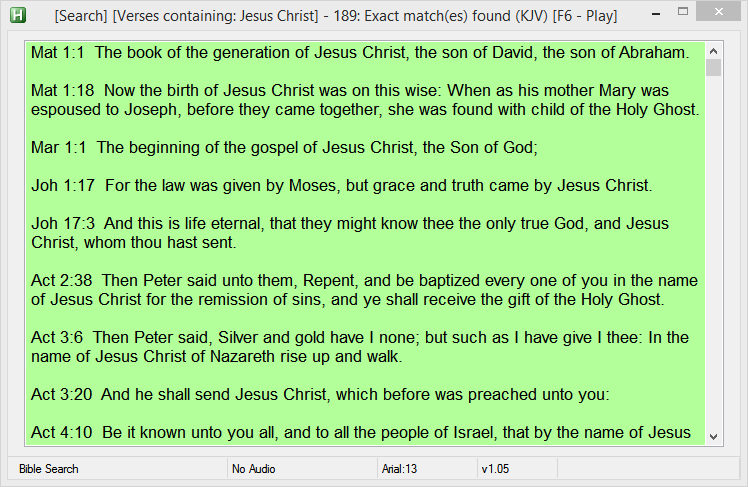 Version 1.03 – Split daily Bible reading into two parts: New Testament and Psalms/Proverbs as it could be quite a bit of reading. Version 1.02 – Minor tweaks to status bar. Version 1.01. When the reading window is resized, it will keep that size the next time you start the program. The minimum size is 570 x 300 so that the status bar is fully visible.